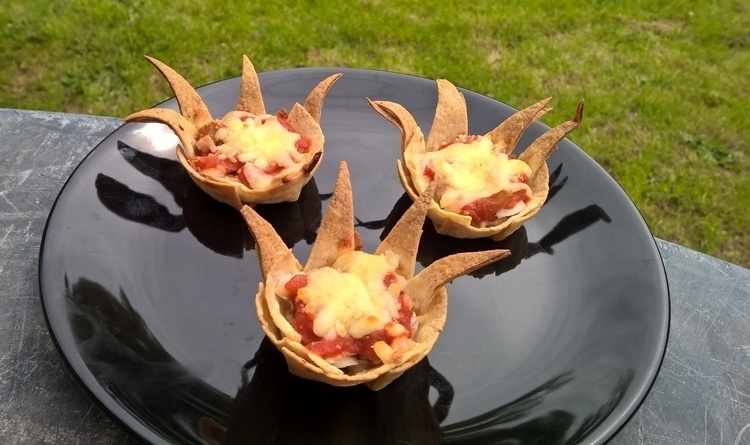 These aren’t any kind of traditional Mexican dish, just something I invented yesterday when I was off work and wanted to make something fun for my lunch, yep, I made them just for me. Six I had hot for lunch, and then the other six I had cold for dinner (is that excessive?). 2. Brush one of the tortillas all over, on both sides, with melted butter. 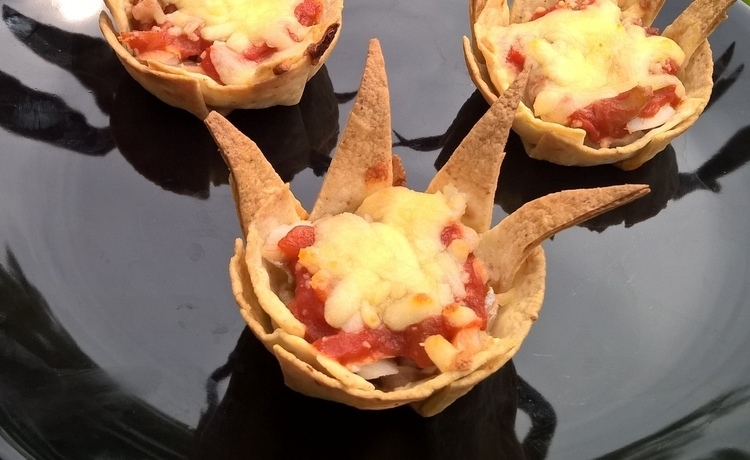 Cut it evenly into 16 triangles using a pizza cutter. 3. Use four triangles for each one. 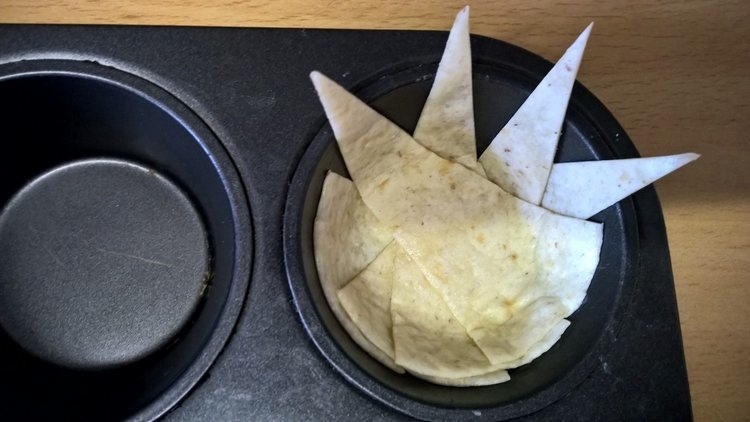 Take the first triangle, and starting half way down the side of one muffin cup, lay the triangle base, press it down, along the bottom and then up the other side with the point sticking out of the top. With the next triangle, start half way across the first triangle. Keep going till you’ve used all four triangles, make sure there are no gaps on the bottom. Press it all down well so that the triangles stick together and form the cup shape. It should look something like the picture below. 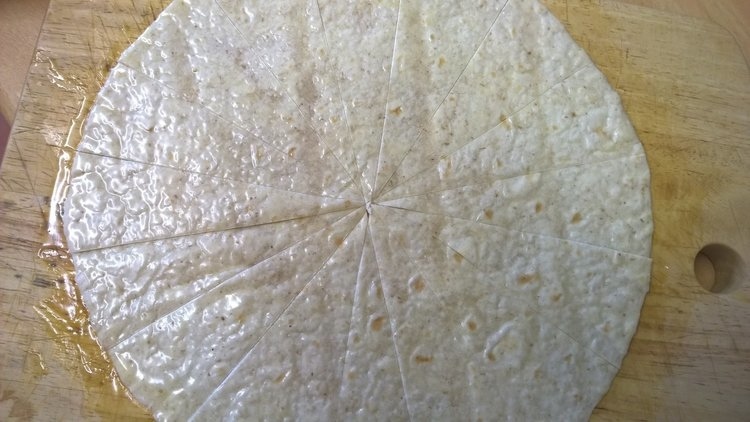 Repeat with the rest of the triangles, and then the other three tortillas, and if you’ve cut the right amount of triangles, it will work out exactly to fill the 12 muffin holes. 4. Bake for 5 minutes. 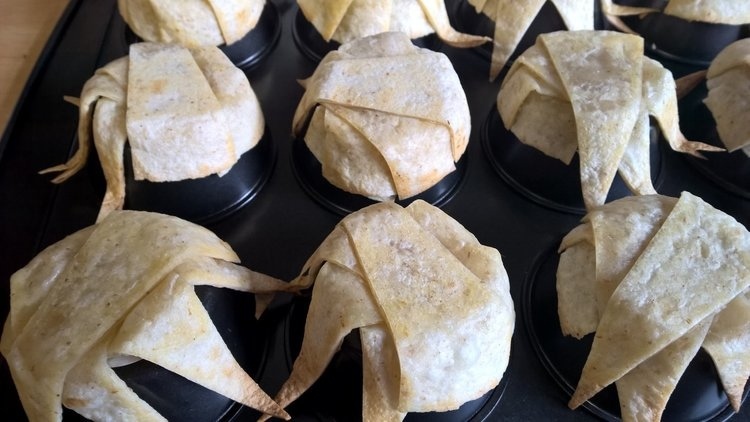 Leave them to cool inside the tin, this will take about 10 minutes (if you take them out before they are cooled, they won’t hold their shape). Then take them out, turn the tin upside down and place them over the underside. Bake for a further 3 minutes. 5. Leave on the tin to cool, again for about 10 minutes. Place them back into the muffin holes on the other side. Divide the fish amongst them, then a spoonful of the salsa on each one, then the cheese. Place back in the oven until heated through and cheese has melted, about 10 minutes. 6. Leave them in the tin for 5 minutes, then remove and eat hot. They’re actually pretty good cold too, reminiscent of cold pizza. Just be sure to refrigerate any that you don’t eat right away when you’ve made them. Oh I love the presentation and the name Vanessa. A really fun dish to serve I imagine. Mhm sounds and looks delicious!